The UVA Chamber Singers present their fall concert – Friday, December 7th, at 8:00 pm. Come hear music from and about winter and northern climates, including Morten Lauridsen’s Mid-Winter Songs (featuring pianist Deke Polifka with the Singers) on poems of Robert Graves; Canadian composer Don MacDonald’s “Winter Sun” on a text from Canadian poet Malca Litowitz; works of Ola Gjeilo, Arvo Pärt, and Edward Elgar; and a reprise of Pēteris Vasks’ Plainscapes, which received a mid-concert standing ovation earlier this season at the Charlottesville Chamber Music Festival. The concert will also include several solo selections sung by UVA’s singers. Tickets are available at the UVA Arts Box Office: www.artsboxoffice.virginia.edu or (434) 924-3376. 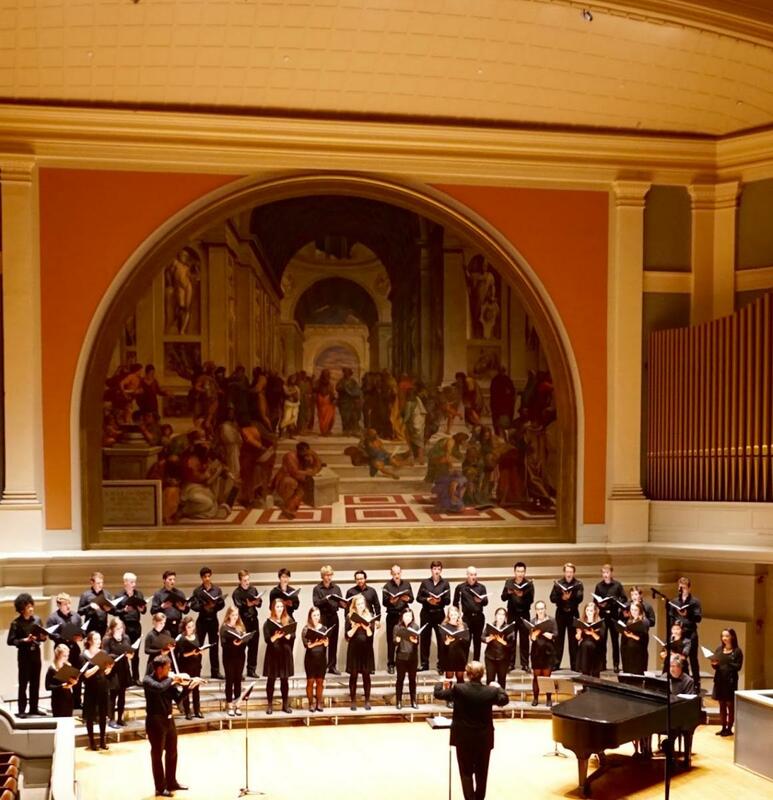 Founded in 2005 and conducted by Michael Slon, the University of Virginia Chamber Singers is a select ensemble drawn from the University Singers, and performs a wide variety of music for chamber choir ranging from early music to contemporary compositions. In addition to their performance for the Governor and other distinguished guests at UVA’s 2017 Bicentennial Cornerstone Celebration, recent performances have included Britten’s Hymn to St. Cecilia, Byrd’s Mass for 5 voices, Vivaldi’s Magnificat, Purcell’s Dido & Aeneas, Copland’s In the Beginning, Allegri’s Miserere, Whitacre’s Five Hebrew Love Songs, Glass’s Three Songs, Burtner’s Palladian Echoes, a program of choral music on film, and Bach’s Mass in B minor with the University Singers. In addition, the group has performed popular standards by Harold Arlen, Jerome Kern, George Gershwin, and the Beatles, a spoof concert of P.D.Q. Bach, and new music by Meredith Monk (with the Meredith Monk Vocal Ensemble), Matthew Burtner, and Eric Whitacre. In 2010, the Chamber Singers made their first appearances at the Staunton Music Festival, including a performance with Grammy-award winning baritone Kevin McMillan, and have collaborated on multiple occasions with Three Notch’d Road, Charlottesville’s professional Baroque ensemble. In 2012, they participated in a workshop with Peter Phillips, director of the world famous Tallis Scholars. 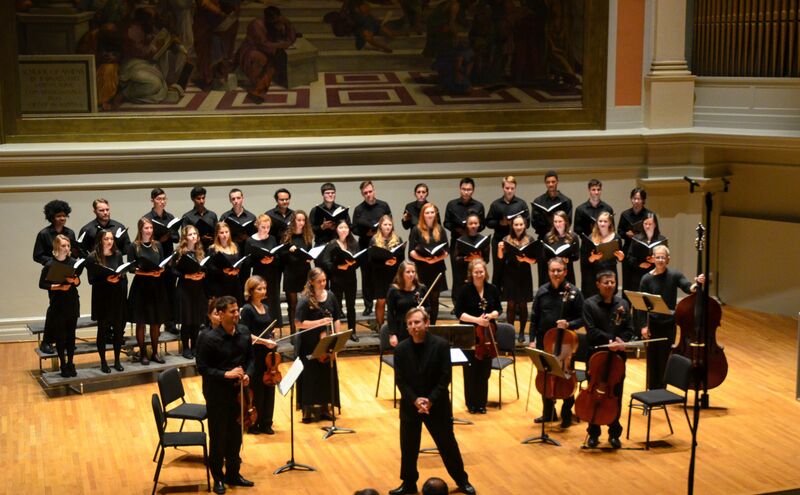 In 2014, they were honored to perform for composer Philip Glass during his UVA Arts Board Residency, and in spring 2015 were heard on tour in Europe with the University Singers, including for Evensong with the Jesus College Choir at Cambridge University. The 2018-2019 season began with a performance of Peteris Vasks’ Plainscapes with the musicians of the Charlottesville Chamber Music Festival. Tickets for the concerts are $10 general/$5 students (UVA students may reserve a free ticket in advance), and are available at the UVA Arts Box Office in the Culbreth building, online at http://tickets.artsboxoffice.virginia.edu or by calling (434) 924-3376. Tickets will also be available at the door.